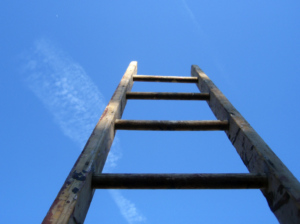 Here are general ladder safety tips applicable to just about any ladder in your inventory, from the common step ladder to combination and telescopic ladders, brand new or not. Avoid ladder-related accidents by doing a quick visual inspection of the ladder you plan to use in doing home repairs this spring time. Check for visible cracks, splits and bends that are telltale signs of ladder damage. The steps and the base of the ladder should not show signs of corrosion. If you see rust spots in any part of the ladder, don’t use anti-rusts spray or any temporary fix to avoid risking your life and limb. Instead, buy a new one or borrow when you can. Use a damp wash cloth and thoroughly wipe the rungs of the ladder clean to remove any presence of grease and oil. Majority of the accidents involving step ladders are slips caused by greasy and slippery steps so make it a habit to always wash any ladder first that you plan on using to ensure your safety. Never put a ladder on an uneven surface particularly if you are working alone. If it’s really necessary and working it’s the only option you have, put large wooden boards on the ground to give the ladder better footing. Ask someone to hold the ladder when you’re using it for optimum safety. Never carry light tools by hand when on the ladder. Instead, mount the tools in a tool belt. Not only is it safe, it’s also more convenient and allows you to carry more tools than you can using your hands. Setup a pulley or wench system for heavier tools or materials that are too heavy to raise by hand lines. No matter what’s written in the equipment manual, always use the ladder one person at a time. Although some ladders are sturdy enough to carry more than one person, any sudden shift in weight distribution or uncoordinated movement could make it a highly unstable and dangerous work platform. Use a wooden ladder when doing electrical repairs to avoid exposing yourself to the unnecessary risks of being electrocuted standing on a metal ladder that’s accidentally in contact with an exposed electrical wire or overhead lines. 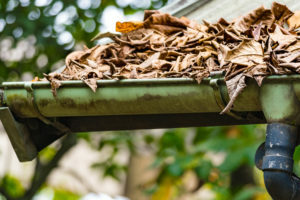 When your house gutters become blocked with leaves and other debris, it is necessary to clean them. This often means climbing a ladder to reach your roof. It is important to follow some safety tips to avoid dangerous falls. Have a Spotter. Anytime you climb a ladder, it is essential to have a spotter on the ground. This person will help brace the ladder so that it is secure. It is extremely common for ladders to kick away or slip at the bottom. When this occurs, you may experience a terrible injury. Do Not Overreach. Most ladders are heavy and hard to control. It is often tempting to reach out as far as you can to avoid moving this clunky piece of equipment. However, you should not lean, overreach, or try to move the ladder while you are standing on it. It is essential to climb down and manually move the ladder to where it is needed. Wear Proper Footwear. 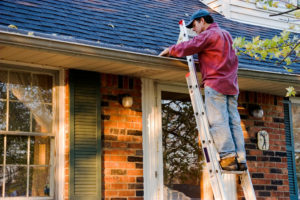 When you clean your gutters, it will be necessary to frequently move up and down your ladder. This means it is important to wear the correct type of shoes with rubber soles. The rubber provides adequate traction so that you do not slip and fall. Inspect the Ladder. One of the best tips for ladder safety is to examine the tool before climbing up. You should look for cracks or loose hardware that my cause the ladder to break. Also, it is important to take note of the maximum capacity so that it does not collapse. Use Proper Tools. When considering ladder tips, it is important to include the need for proper tools. For example, when cleaning your gutters, you should have a broom, vacuum, and flusher handy. It is also important to be connected to a harness, especially when scaling a two-story home. It is essential to use the correct ladder as well. It is never wise to place a stepladder on the roof. An extension ladder is the best tool for tall structures. To avoid the need to use a ladder and risk injury cleaning your gutters, you may wish to consider our K-Guard System. Our product is unlike anything on the market and provides strength, durability, and attractiveness to your home. Our patented system covers your gutters and keeps leaves and debris from causing clogs. For more information, visit our website.